At issue is the “Civic Engagement Gallery,” part of the archives of the Republican power-couple Senate Majority Leader McConnell and his wife, U.S. Secretary of Transportation Chao. McConnell is an alumnus of the school. 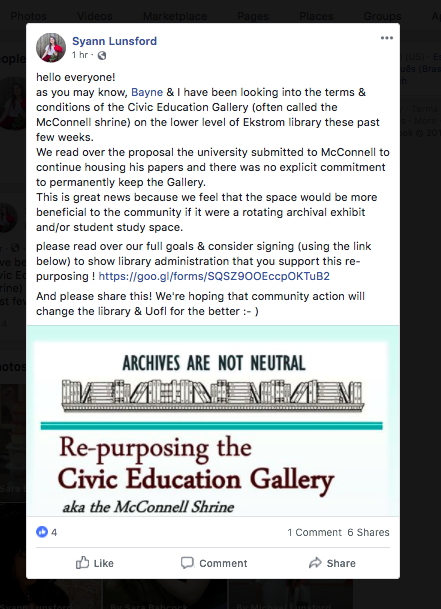 “We urge you to sign and declare support for the repurposing of the McConnell-Chao Archives Civic Education Gallery and restoring the library’s control over the space,” states the petition, started by students Bayne Lutz and Syann Lunsford, both of whom did not respond to requests from The College Fix seeking comment. However, after The College Fix’s media requests, the petition was altered to tone down its rhetoric. Sen. McConnell’s office did not respond to emails and a phone call seeking comment. They suggest instead to transform the space into a student study area, or, perhaps display the Louisville Underground Music Archive or an LGBTQ+ item collection center, or a lounge for library staffers. In a museum-like sphere, the Civic Engagement Gallery highlights the careers of Sen. McConnell and Secretary of Transportation Chao by showcasing personal items and memorabilia from both government figures. As an interactive educational facility, the gallery is “designed to educate visitors about American government, history and politics” through a biographical lens. Visitors can take mock citizenship tests, learn more about American history and the Constitution, or watch an educational films on either the history of the Senate or Sec. Chao’s rise from immigrant roots to working in the White House. 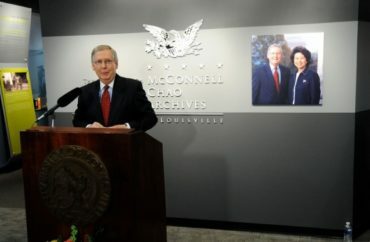 Opening its doors in 2009, Sen. McConnell picked his alma mater to preserve and archive an array of items and documents at U. Louisville’s Ekstrom Library and both he and Secretary Chao continue to add to the archive. McConnell chose the public university with the hope it “will help to educate people about the importance and the purpose of Congress, and the value of our two-party system,” he said. If campus leadership accepts the petition, the activists say they are prepared to fundraise to bring the re-purposing process into fruition. If rejected, they say they are equally prepared to “protest” the library as well. 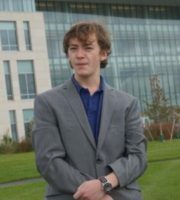 Alexander Pease is an undergraduate student at the University of Massachusetts Boston. He studies political science, philosophy and law. He is a member of the Undergraduate Student Senate. Pease is a contributor to The Boston Free Beacon. Presently, he is especially interested in existentialism, U.S. foreign policy and political theory. Aside from journalism and politics, Alexander enjoys playing drums, listening to music and poetry.